Acer palmatum 'Katsura' boasts stunning lobed, orange new growth with reddish margins in the spring. The leaves fade to green, retaining their orange edges before turning completely yellow in the summer. Autumn then offers a spectacular display of vibrant yellows, reds and oranges. 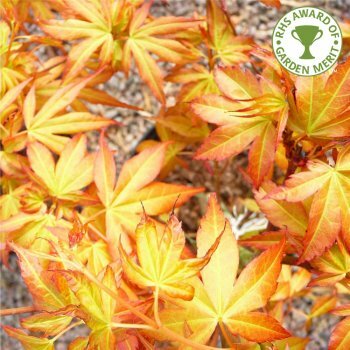 Reaching an approximate height and spread of 6 x 4 metres in 20 years, this award-winning Japanese Maple is a fantastic choice with a long period of interest. Acer palmatum 'Katsura' is best positioned in slight shade although can also tolerate full sun, and prefers a moist, well-drained soil. Pot grown Katsura Japanese Maples can be planted at any time of the year. Firstly, remove all weeds and grass within a metre of your desired planting hole then dig a square hole as deep as your root mass and approximately 2x as wide. To help your tree establish more effectively, we advise sprinkling root grow in the hole, especially if you have poor soil. If you’re planting Japanese Maples in spring or summer, water well and regularly for the first few months. If you’re planting in autumn, you may only need to water a little. Keep an eye on young trees and increase watering if there are extended periods of hot or dry weather. If possible, use rain water instead of tap water as this is more acidic and better for foliage colour. We stock a range of irrigation kits for more effective watering.